Nepenthes talangensis is a highlander species. This particular clone came from Borneo Exotics. I've had difficulty with this particular clone getting it to pitcher over the years. For some reason it takes a long time to acclimate before producing pitchers. However, it produces lots of flower spikes and seems to be constantly in spike. 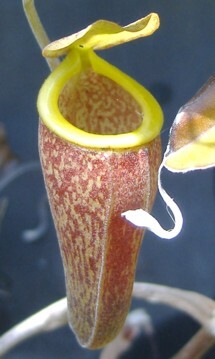 The pitchers on mine are small and similar in size to N. tenuis. This species is used a lot in hybrids and adds much personality and attractiveness to whatever N. talangensis is crossed with. It also produces many offshoots making cuttings readily available. All clones I've seen available have been from tissue culture and not seed.